Telus flanker brand Koodo has launched an interesting referral promotion related to last year’s 10GB $60/month deal. 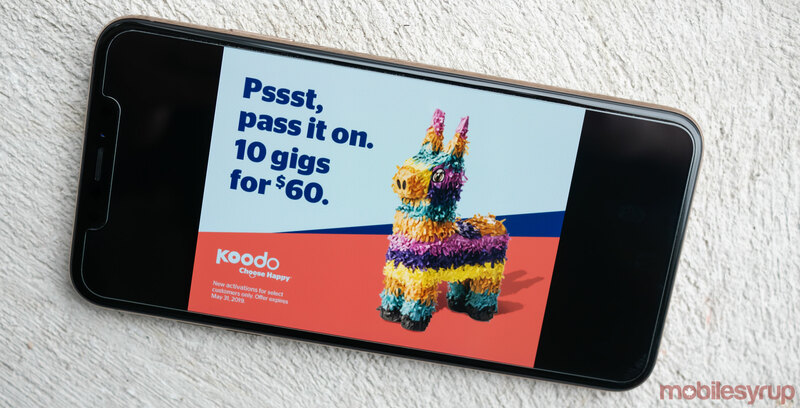 The offer allows any current Koodo subscriber with the 10GB $60/month plan to give the same deal to two other individuals. All the people who are referred by current subscribers need to input the promo code ‘Happy,’ and then use one of the two unique validation codes offered by Koodo. The carrier is sending out text messages that include these referral codes to subscribers currently on Koodo’s 10GB/$60 per month plan. The offer is valid both in-store and online at koodomobile.com/switch, according to Koodo. It’s important to note that the offer only works with new customers and plan renewals. This means that if you’re currently a Koodo customer, you won’t be able to take advantage of the referral offer unless you sign up for a new contract. The referral codes are ten digits long and include numbers with a single letter at the end. 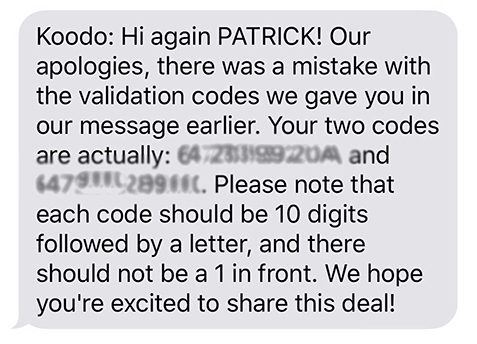 While an initial text was sent out featuring codes with 12 digits and a single letter, Koodo followed the referral with two correct codes that remove the ‘1’ at the front. Activating the code requires a process that is a little convoluted. First, navigate to koodo.com/switch. Next, there are two options available — you can either get a new phone or SIM card from the carrier. Once you’ve selected either to get a SIM card or to purchase a new phone, you then need to navigate to your shopping cart and add the specific referral promo codes. There is then text present on the right side of the screen that says ‘Promo code.’ A purple bar then appears at the top of the page that reads ‘Review plan options.’ Click this link and then select the 10GB $60 per month promo plan listed in purple. The deal is valid until May 31st according to Koodo’s text message. Update 10/04/2019: The story has been updated with information about Koodo’s follow-up correction text regarding this referral offer.